“Coming out here, this is my vacation every year,” William Kakon said just moments after winning a prestigious gold bracelet at the 2015 World Series of Poker. Wait. What kind of “vacation” allows someone the opportunity to make $196,055 after spending a few days in Las Vegas? Kakon won the $1,500 buy-in Limit Hold’em event, which was played over a three-day period at the Rio. The 38-year-old real estate broker and healthcare professional “on vacation” from Miami, FL topped a larger than expected field of 660 players and was also presented with his first WSOP title. The victory was particularly satisfying, since Kakon previously made two other deep runs in Limit Hold’em events in the past, finishing as high as 6th place back in 2010. Kakon has an interesting background, highly unusual for a WSOP champion. He was born in Morocco, believed to be the first native from that country to win a title. Kakon grew up in Casablanca, then moved to Paris at age 18. Next, it was on to New York, Los Angeles, then back to Paris. Now, Kakon resides in Miami. Kakon is not only a gold bracelet winner, now. He’s been listed among the top 1 percent of all brokers in the United States for six consecutive years, with more than $3 billion in overall sales volume. However, even that wasn’t enough to satisfy his competitive spirit. So, Kakon went into the healthcare field more recently, where he now operates another successful business – that is, while he’s not winning gold bracelets while on vacation. Kakon didn’t have much trouble at this final table once he seized the chip lead. It appeared that Daniel Needleman might pose a challenge when play was three handed and the two big stacks were battling for supremacy. However, once Mike “Champagne” Lancaster was eliminated in 3rd place, Kakon used his big stack along with the high blinds and limits to gradually grind down his final opponent. “When I get deep in an event, I play to win it,” Kakon revealed. Second Place: Daniel Needleman, a 45-year-old poker player from New York City finished as the runner up. This marked his first WSOP-related cash, which was worth well over six figures at $121,051. Third Place: Mike “Champagne” Lancaster finished 3rd. He’s a 33-year-old businessman originally from Australia, now living in San Francisco. The former collegiate track and field athlete (full scholarship) cashed for the 6th time at the WSOP, which paid $78,693. Fourth Place: Bryan Pimlott went out in 4th place. He is a 44-year-old orthopedic surgeon from Phoenix, AZ. Pinott enjoyed his best WSOP finish in this tournament, which was his eighth time to cash. His share of the prize pool came to $57,799. Fifth Place: Shannon Shorr took 5th place. He is a 29-year-old professional poker player from Birmingham, AL. 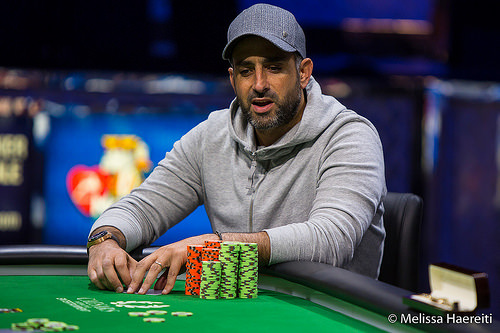 This marked Shorr’s 38th time to cash in a WSOP event, and was his 7th final table appearance. Shorr, now frequently mentioned among the best players still without a gold bracelet victory, pocketed $43,053. Sixth Place: Kevin Song, a longtime poker pro originally from South Korea and now living in Brea, CA, finished 6th. He won his gold bracelet 18 years ago, and now has 34 cashes in WSOP events. Song earned $32,485 for this finish. Seventh Place: Brandon Cantu, the bombastic 34-year-old poker pro from Las Vegas was aiming for what would have been his 3rd gold bracelet, following wins in 2006 and 2009, which would have created the third three-bracelet winner this year, so far (Robert Mizrachi and Max Pescatori were the other two.). Instead, Cantu had to settle for a relatively early exit from the final table, which paid $24,796. Eighth Place: Hector Contreras, a 32-year-old driver from Los Angeles, CA ended up in 8th place. This was his first time to cash in a WSOP event of any kind, which paid $19,138. Ninth Place: Alexander Kostritsyn, a 28-year-old poker pro from Volzsky, Russia was the first elimination from the official final table. He has many cashes in European events, and 17 WSOP in-the-money finishes, worth in excess of $1 million in earnings. Ninth place paid out $14,924. OTHER NOTABLE IN-THE MONEY FINISHERS: Five-time gold bracelet winner David Chui finished 14th. FUN FACTS: For many years during the 1980s and 1990s, $1,500 buy-in Limit Hold’em was the first event listed on the WSOP schedule. It routinely drew the biggest field sizes, even larger than the Main Event Championship during an era when Limit Hold’em was far more popular than No-Limit in public cardrooms. The popularity of this event began to decline about eight years ago, as field sizes dipped below 500 for the first time in two decades. However, each of the last two years has seen a significant increase in turnout for this event, as 657 turned out in 2014, which increased up to 660 this year. On hand 70 of heads-up play, Daniel Needleman raises from the button and William Kakon (above) calls. The flop is . Kakon checks, and Needleman bets. Kakon raises, and Needleman puts in a third bet. Kakon calls. On the turn , Kakon check-calls Needleman. The river is bet by Kakon and Needleman goes all in with Kakon calling once more. Kakon shows which beats Needleman's . 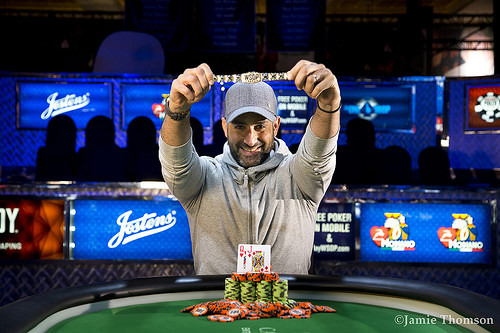 Kakon wins $196,055 for 1st place and the coveted WSOP gold bracelet. Needleman (below) will take home $121,051 for his 2nd place finish. William Kakon raises from the button, and Daniel Needleman folds. Daniel Needleman calls from the button and William Kakon checks. The flop is checked by both players. The turn is bet by Kakon and he wins the pot. On the button, William Kakon raises, and Daniel Needleman three-bets. Kakon calls, and the flop comes . Needleman bets, and Kakon calls. The turn is the , and Needleman bets. Kakon calls, and the river is the . Needleman check folds, and Kakon scoops the pot. Daniel Needleman folds his button and William Kakon walks. On the button, William Kakon calls, and Daniel Needleman raises. Kakon calls, and the flop is . Needleman bets, and Kakon raises. Needleman three-bets, and Kakon calls. The turn is the and Needleman leads out. Kakon calls, and the river is the . Needleman bets, and Kakon folds. Daniel Needleman raises and William Kakon calls. The flop is . Kakon checks and Needleman bets with Kakon calling. On the turn , Kakon checks again and Needleman bets with Kakon folding. Daniel Needleman gets a walk. Daniel Needleman is on the button and raises to William Kakon who calls. The flop rolls out . Kakon checks, Needleman bets and Kakon calls. On the turn , Kakon and Needleman both check. The river goes check-check again and Kokan's wins the pot. On the button, William Kakon calls, and Daniel Needleman checks. The flop is . Needleman check raises, and Kakon calls. On the turn, Needleman check raises again. Kakon calls, and the river is the . Both players check. Kakon shows and scoops the pot. 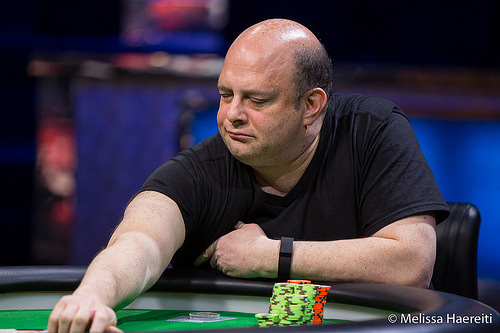 Daniel Needleman raises from the button and William Kakon calls in the big blind. The flop runs out . Kakon check-calls a bet from Needleman. On the turn , both players check. The river is the and Kakon check-calls another Needleman bet and wins after showing down . On the button, William Kakon raises, and Daniel Needleman three-bets. Kakon calls, and the flop is . Needleman bets, and Kakon calls. On the turn, Needleman bets, and Kakon calls. The river is the and Needleman bets. Kakon raises, and Needleman folds. Daniel Needleman raises from the button and William Kakon re-raises. Needleman raises again and Kakon calls. The flop is . Kakon checks, Needleman bets and Kakon calls. The turn , Kakon check-calls a Needleman bet. The river puts a on board. Kakon checks, Needleman bets and Kakon folds sending the pot over to Needleman. William Kakon calls from the button, and Daniel Needleman checks his option. The flop is . Needleman bets, and Kakon folds. Daniel Needleman calls from the button and William Kakon raises, which Needleman calls. The flop is . Kakon bets and Needleman calls. The turn is the . Kakon checks and Needleman bets with Kakon folding behind. On the button, William Kakon raises, and Daniel Needleman calls. The flop is . Needleman check calls a Kakon bet, and the turn is the . Needleman check raises, and Kakon folds. Daniel Needleman raises from the button. William Kakon flats from the big blind. The flop is . Kakon checks and calls Needleman's bet. Kakon bets the on the river which is enough to make Needleman fold. On the button, William Kakon raises, and Daniel Needleman three-bets. Kakon calls, and the flop is . Needleman bets, and Kakon calls. On the turn, Needleman bets, and Kakon raises. Needleman folds, and Kakon wins the pot. Daniel Needleman raises from the button and William Kakon defends. The flops rolls out . Kakon checks and Needleman bets. Kakon raises and Needleman concedes the pot.